Gone are the days when mass marketing was considered to be effective. Now, micro-marketing has taken over. We don’t just want our communications to be relevant to our needs. But, we also need them to be pertinent to our cultures and region. This is where IP targeting comes in handy. Interactive Advertising Bureau defines IP targeting as delivering content to your customers who are personalized through the use of their geographic location. Each device is equipped with an IP address which can be used to detect the location of the device. The information about the location can then be used to micro-target and deliver content that is relevant to the given users. Have you ever watched videos online and found ads specific to your country or region is shown to you? IP targeting is used to deliver those ads. Marketing with the help of IP targeting is bound to make more difference than mass marketing. After all, communication is likely to be more relevant to users. The chances of them availing the service then get higher. For instance, if you show an ad of shampoo available in the region, the chances are your audience might buy it. However, if you show an international ad, it will be of no use to your targeted customers. While IP targeting allows marketers to realize great benefits regarding customer retention and sales turnover, the method has its problems. The biggest challenge is getting the desired IPs and identifying the location of your customers. 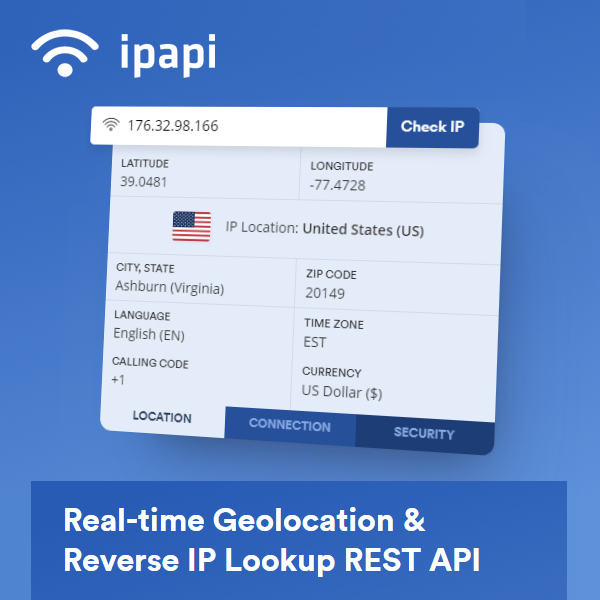 Ipapi is an API for IP Geolocation that allows organizations to find the location of different IP addresses. It uses IPv4 and IPv6 to identify locations which then helps an organization in sending personalized content, determine which currency to reflect prices in and to detect frauds. The company has a portfolio of over 30,000 clients that are benefitting from its services. Delivering quality IP data. This is ensured by the use of partnerships with significant ISPs along with a rigorous process of data collection. The platform provides two packages, free and a premium one. The free service lets you identify the location of 10,000 IPs. The fee of the premium package depends on the requests made. The starting amount is $10. Delivering extensive data using the IP address. Information provided includes the location of the IP address (continent, country, region, zip code, etc), Time Zone (including current time), the currency used, and connections (detecting proxy, ISP and ASN). Ipapi has been successful in delivering immense benefits to its users. The fact that you can choose between free and premium packages makes this platform an excellent choice for startups and big corporations alike. Overcome the challenges associated with IP marketing with the help of Ipapi. Stand out from your competition by being relevant to your customer base. Know their location, currency and time zone and use this data to alter your product or marketing campaign. Succeed in your business.